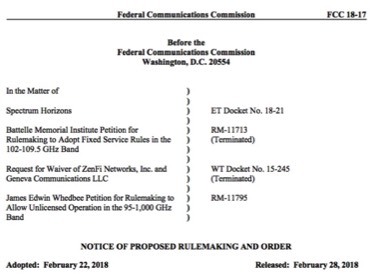 On February 22, 2018, the Federal Communications Commission adopted a Notice of Proposed Rulemaking (NPRM) in Docket 18-21 with the title “Spectrum Horizons” dealing with the use of frequencies above 95 GHz. Since 2003, 95 GHz had been the upper limit of explicit FCC rules permitting use of spectrum with routine approvals. New products at higher frequencies have needed non routine deliberate which were usually very slow and nontransparent. Public comments received to date by FCC in this docket are located here.